Computer world- Shortly after the NASA space shuttle Endeavour undocked with the International Space Station this afternoon, officials called the mission's robotics work a huge success. The shuttle and its seven-person crew spent 10 days, 23 hours and 39 minutes linked up with the space station to install the last of the Japanese laboratory there. And for those nearly 11 days at least one, if not two, robots were at work almost every day. Without them, the mission simply could not have been completed, according to Bill Jeffs, a NASA spokesman. "This was a challenging mission from a robotics standpoint," Jeffs said in an interview with Computerworld today. "We used the robotic arm on the space station, the robotic arm on the space shuttle and the arm on the Japanese laboratory. In terms of robotics, it's been very challenging but very successful." 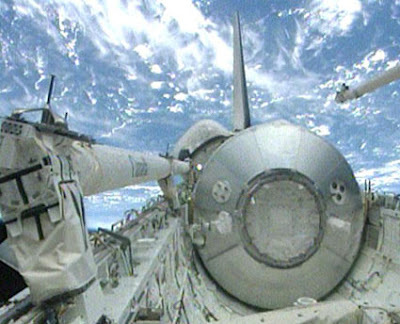 After the undocking, the Endeavour embarked on a so-called "fly-around" the space station which allows the astronauts still there to visually scan the outside of the shuttle for any problems with the critical heat shield. Once the inspection is completed, NASA pilot Doug Hurley is set to maneuver the shuttle away from the station and put it on a course to earth. Endeavour is scheduled to land at 10:48 a.m. EDT on Friday at the Kennedy Space Center in Florida. Before the mission, Holly Ridings, lead space station flight director for Endeavour, called it one of the most technical ever to be undertaken by NASA. With an ambitious schedule of five spacewalks, the astronauts onboard both the station and the shuttle used three robotic arms.